What I do remember of French cuisine, and this is the important part–is the techniques. French cuisine, especially as it is practiced in restaurants, is all about correct, precise technique. And once these techniques–of cutting, of sauce making, of braising, roasting, of sauteing–are mastered, one can apply them to any collection of ingredients and produce a dish which may not be French in a traditional sense, but will certainly be French in character and spirit. So, now we come to the topic of the day–Poulet Roti–or as we say in English, Roast Chicken. And once it is mastered, Roast Chicken is extremely versatile. You can make pan sauces for it, gravies, or you can baste it in cream and wine, then reduce that into a sauce with sauteed mushrooms. You can serve it hot or cold and you can use leftovers for panini sandwiches or salad. 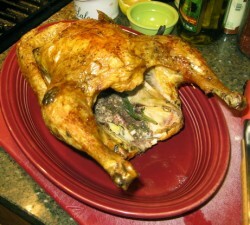 Now that I have said all of that, the truth is, there is no one “right” way to roast a chicken! I have my way to do it, Bourdain has his, and Julia Child has hers. And every other good chef and cook has their method. Some folks truss the birds up like Bettie Page (as Bourdain would say), while others slit the skin of the bird and tuck the legs in the flaps as a sort of self-trussing method. Some folks lay the bird down in a roasting pan on the top of a bunch of tasty vegetables which get to roast in the flavorful chicken juices. Other folks set the chicken on a rack of some sort, and scatter vegetables around the rack. Some baste in stock, some in wine, some in butter. Some stuff their birds with elaborate dressings, while others just stick aromatics inside, while others just leave the cavity empty. And the really cool thing about this fact is that most of those methods result in really great roast chicken. I think that the secret to great roast chicken is two-fold: first, obtain a really good chicken that is naturally full of flavor, preferably from a local farmer, but failing that a free-range or kosher bird from the grocery store will do. Second, don’t overcook your chicken once you have expended all the time and effort to find it, obtain it and prepare it for the oven. That’s the thing, if you start with a good bird in the first place and don’t dry it out by cooking it for longer than is necessary, you are pretty well guaranteed a good dinner. So, here is the way that I make Poulet Roti, and my method is based on Julia Child’s along with a couple of methods I learned in culinary school. The seasonings I happened to use this time are based on the flavors of the blend of herbs called Herbes de Provence, which includes fennel, basil, tarragon, thyme, lavender flowers, marjoram and rosemary. You can use other herbs if you like. The type of wine can be changed–you could use sherry or marsala instead, for example. Then, prepare the chicken. Remove any giblet packet (mine just had the neck), and rinse well with cold water. Remove any feather bits and then pat well to dry. Trim any excessive skin and excess interior fat from the bird. Then, blend together the two tablespoons of softened butter with the first measure of salt, the minced herbs, the lemon zest and minced garlic. Gently, with your fingers, loosen the skin of the chicken at the edge of the breast, and carefully stuff half of the seasoned butter under each side of the breastbone, spreading it over the flesh of the breast as evenly as possible, so that the butter is between the skin and meat. You have to be careful not to pierce the skin from underneath with your fingers, but other than that, this is a simple operation. Rub the outside of the skin with the 1 tablespoon of butter and then sprinkle it with salt and however much freshly ground black pepper you like. Salt and pepper the inside of the chicken as well. Now stuff the cavity with 1/2 of the lemon (when you put it in the bird, squeeze it a bit to get some juice in there), one clove’s worth of the garlic slices and the rosemary and thyme sprigs. Now your chicken is prepared for the oven. Set it breast side up on a V-shaped roasting rack or just a plain old cooling rack inside a roasting pan which has been rubbed all over with 1 tablespoon of the olive oil (I prefer V-racks as you can see–lots of hot air gets around and in the chicken with those and you get crisp, golden brown skin all over that way) and put it into the oven. Meanwhile, put the 1/2 of the wine, stock, the remaining clove of garlic slices and the giblets into a pot and bring to a simmer. Cook at a simmer until the liquid is reduced to about a cup. Turn the heat off and let the giblets and the garlic steep in the pot. After the chicken has been in the oven for about ten to fifteen minutes, the skin should be fairly evenly browned. Turn the heat down to 350 degrees F. and pour the remaining half cup of wine in the bottom of the roasting pan. Baste now and again with the remaining two tablespoons of olive oil. If the chicken drippings begin to burn, turn the heat down slightly, and if the skin darkens too much, cover it lightly with a tent of foil. Check the chicken for doneness after about a hour and five minutes of roasting: the signs that it is finished cooking are that the breast swells up slightly and will spring back when pushed with a forefinger, the aforementioned clear yellow juices when the leg or the meaty part of the thigh are pricked, the skin should be lightly puffed and crisp. If you take hold of the drumstick, it should joggle easily in its socket. 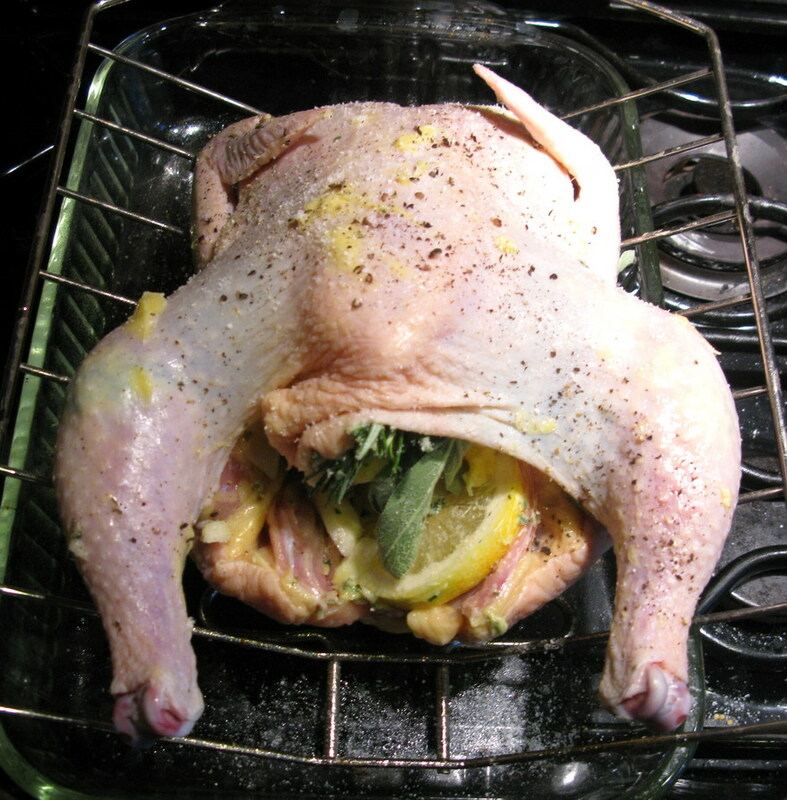 For a final check, lift the chicken slightly and drain the juices from its vent–they should also be clear yellow. If they are still rosy, then roast it for another five minutes or so. When the bird is done, remove it from the pan with its rack and set it on a carving board or serving platter to rest while you make the pan sauce. Put the roasting pan on top of the stove and turn the burner up on medium high heat. Remove all but 1 or 2 tablespoons of fat from the pan. Strain the stock, discarding the giblets and garlic slices and pour the liquid into the pan. Stir and cook, scraping up all the browned bits (which are called fond) from the bottom of the pan, dissolving them in the stock. Reduce the liquid until it barely coats the back of a spoon and then sprinkle half of the roughly chopped herbs into the sauce, whisking them in well. (If you want, you can add a teaspoon or two of butter to the sauce to enrich it–but really, we have used plenty of butter already, so it is up to you if you want to do it.) Drizzle a spoonful of the sauce over the bird and sprinkle it with the rest of the herbs, then serve the rest of the sauce on the side. This bird is great with roasted vegetables like baby carrots, fingerling potatoes and pearl onions. It’s so cool that you are doing these recipes!! Thank you! Have you noticed how hard it is to find a “3 pound chiken” these days? What we used to buy now all seem to be all sold for the deli spit. More and more what I see is 4 1/2 to 5 pound and often more. I have no real objection to larger chickens if they actually yeild “more chicken” but it seems instead they carry more fat and in many cases – brine (which at 8 pound to the gallon makes a nice profit for the vendor). They also don’t seem to roast like they used to – finishing the legs and wings long before the thigh joint and deep breast meat are properly cooked. I begining to think I need to treat these like a turkey – starting them breast down and perhaps covering the wings. Mike–I haven’t bought a grocery store chicken for so long that I wouldn’t know. Maybe someone else can help you out–though the industrial brining probably has something to do with it. I actually had to climb a learning curve with roast chicken. My problem was, believe it or not, not cooking them *enough*. I blame my mom who overcooks all meats for fear of bacteria. It wasn’t until I was a teenager when I discovered eating chicken breast didn’t have to be like eating sawdust. I’ve got a good technique going now, so it’s neat to see how Barbara does it. I give my birds a butter massage too, but I really must try the pan sauce. I also brine my chickens. I got the idea from Alton Brown’s advice to brine turkeys and figured it might be good with chickens too. I’m not sure if it really makes a huge difference though. Everything else depends on what I happen to have on hand at the time (that is, what I rub on the chicken or put underneath the chicken or stuff into the chicken or pour over the chicken). The second best things about roast chickens are how flexible they are. They taste good with everything from some delicate herbs to BBQ rubs. The best thing about roast chicken, though, is the leftovers. One chicken yields at least two meals for me and my sweetie, so I’ve gotten into the habit lately of making one every weekend. That way later during the week I can throw together some chicken tetrazzini or chicken enchiladas or chicken salad for us to take to work for lunch. And then the bones go in a gallon ziplock bag in the freezer and when I have time and the bag is full it becomes chicken stock. So that might count for another meal if you count the stuff I use the stock in.